sassyfrazz: KidsCraft Playhouses : Review & Giveaway!! When my kids can use their imagination with play, and step into creativity...I am all for it! I was recently sent a really fun Playhouse for my kids to explore, decorate, color/marker, and make their own. 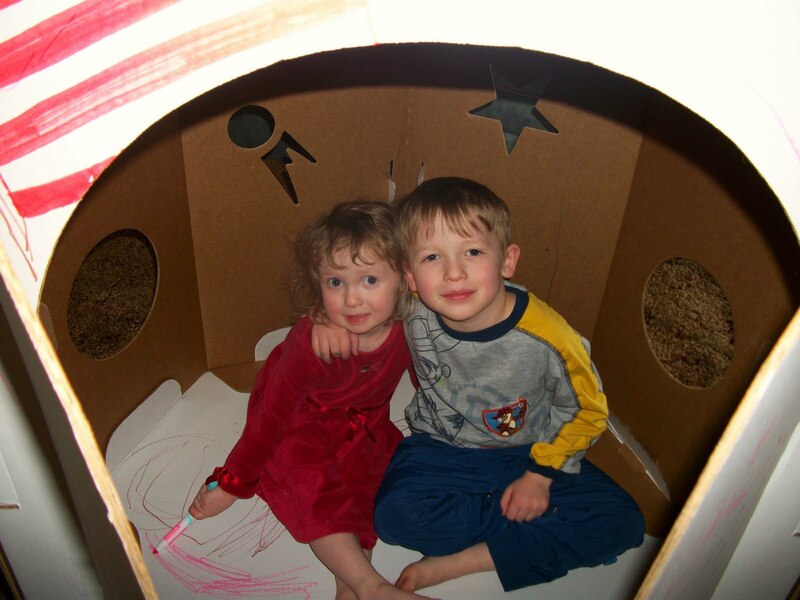 (I helped a little) KidsCraft Playhouses: made from 100% recycled materials, are cardboard playhouses that fit 2-3 kids. I was sent the Shuttle Imagination to review, and my kids were thrilled! The Shuttle came in one large box, and the set up only took a little while. I like how the cardboard is sturdy...because my kids are busy, and they need something that will hold up to their test. Here is a picture of my little guy, Cole age 1, entering the spaceship. Cole was so excited about going inside to be with his sister. He loved just going in and out. As you can see, my daughter loved the Shuttle Imagination, too! She was so excited and could barely wait for me to put it together. She loved looking through the holes, which were designed like space shapes: circles, stars, flying rocks, etc. Easily the Shuttle Imagination holds 2-3 kids comfortably. I love that the KidsCraft Playhouses are built for more than one child, because kids love to play together. Peek-a-boo Madelyn! She loved looking out at her brothers. Isn't she cute? Here is Caleb looking out, he loved this new playhouse, too. Here is his design around his face that he decorated. I think that the KidsCraft Playhouse is a great place for kids to let out their creativity and draw all over something (that is OK) and they can make it their own. I also love that this playhouse is already ready for kids to play in, you just need to assemble it for them. I have made many play houses out of card board boxes, and it is tough getting scissors through the card board, and it doesn't always look that great. However, the KidsCraft Playhouses are designed with saving the parent's time in mind (in my opinion). The kids all had a great time coloring, thinking, drawing, and picking just the right colors for their Shuttle. It was fun to see them so hard at work. I highly recommend the KidsCraft Shuttle Imagination to you. I was thrilled with this product, and my kids absolutely love it. This makes for a great indoor project when it is raining or snowing out...and my kids have so much fun in it all the time. (especially when I am making dinner). *KidsCraft offers two designs: Shuttle Imagination ($69.95) and Creation Cottage ($59.95). The Shuttle Imagination measures 39”L x 34”W x 72”H. Fin attachments are 12” long. Two dads and a grandfather from Atlanta got a first hand look at how the cardboard box captures a child’s way of thinking. While packing up their financial services business, moving from one office to another, their kids tagged along. Although the fathers brought along playthings like coloring books and crayons for the 3 to 7 year olds, it was the empty boxes that captivated the youngsters. The dads saw the sparks of a business and KidsCraft Playhouses was born. KidsCraft Playhouses is generously sponsoring to give a playhouse away (winner's choice of style: Creation Cottage or Shuttle Imagination)!! This contest is open to those in the United States (bloggers or non-bloggers). To enter, you need to go to the KidsCraft website and find out one interesting thing about the company. Contest will end on April 27th at midnight. This post was written for KidsCraft.com, who supplied a playhouse for me to review. I was also offered a chance for my readers to enter a giveaway with the sponsorship from KidsCraft. I was not compensated for my time or written review. I love that their products are 100% recyclable. Thanks for the chance. I think it's interesting that they also sell natural soy crayons on their website. Those would work great for decorating the playhouses. I think it's cool they have eco crayons. I also like that they sell Natural Clementine markers on their website. LOVE that their playhouses are made in the U.S.A. using 100% recycled cardboard materials, and best of all they are 100% post-play recyclable as well. Facebook Fan of Kids Craft. The company came up with the rocket and house ideas when their kids were playing with cardboard boxes after an office move. Love how they give a portion of their profits to charities. Your kids look like they are having a blast. KidCraft Playhouses gives a portion of all proceeds to benefit children's charities. I learned that the company is located in Atlanta, GA. I like that you can buy Clementine natural paint on their site. I learned that they "give a portion of all proceeds to benefit children's charities." Thanks for the giveaway. Fan of KidsCraft on FB. I learned that part of the profits goes to various children's charities. I also love that they give a portion of their proceeds to children's charities! Wonderful! I love that they use 100% recycled cardboard materials. I like that a portion of all proceeds to benefit children's charities. they offer soy crayons in a varity of shapes! This would be great at a wedding to entertain the kid's! I love that it is sturdy cardboard, easy for the kids to color on then, and much more fun to play in without having it wobbleing all over the place. These at a wedding could really sell these I bet! People may want to have them at birthday parties, summer BBQ's in the backyard to keep the kid's busy, graduation parties...a lot of people may not even know these are available! I love that it let's the children explore their creativity. How fun! I am crossing my fingers for this one, my son would love this. How fun to be able to decorate it yourself. I like that they come undecorated. I think helping my daughter decorate a house would be a lot of fun for both of us! I like that their products are made in USA and 100% recyclable. IMy boys would love the shuttle and I love that they are made from recycled material. I love the fact that this stuff has been made out of 100% recycled cardboard. I saw on the Kidscraft FB Page that they are coming out with smaller versions of their cottage and shuttle. How cool ! They never stop!! =D Love these products!! I love that more than one child can play in the playhouses at a time. I just love this company! I have been trying to win one for so long now, been crossing my fingers!! What a creative fun thing for children, let them run their imagination wild! Free shipping on all Kidcraft orders till 4/30 in honor of Earth Day. I think it’s great that they give a portion of all proceeds to benefit children’s charities!!! I love that their products are 100% recyclable. I think it's great that their products are recyclable! I love the idea that it is totally recyclable!! also love the natural markers they sell!! I like the Eco Star crayons on their site. I like how the star shape provides several points from which to color from. I learned that it not only comes from recycled material, but it is also 100% post-play recyclable. 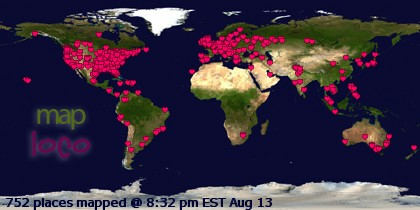 I follow Kids Craft USA on Twitter (mail4rosey). I like that they are a partner of Trees for the Future. My daughter and son would love the Shuttle Imagination. I love the little house, and decorating it in any way their little minds want! Siblings could really bond with this, because all ages can put their creativity into it! glitter, poffy paint, ribbons, rhinstones...you could really put a lot into this! Again, awesome idea for a WEDDING!! !ADVERTISING FOR IT TOO!!! I love that the playhouses are made in the USA. They donate a portion of the proceeds to charity. The founders of KidsCraft knows kids! They have 8 grandchildren/kids between them. I love that these are 100 recyclable after your kids outgrow them! Their playhouses are made in the U.S.A. using 100% recycled cardboard materials, and best of all they are 100% post-play recyclable as well. I am a google subscriber. Love that they planted 1000 trees in recognition of Earth Day! They give a portion of all proceeds to benefit children's charities! It’s nice that they also sell Clementine Glue on their site. The paints are also all natural. KidsCraft Twitter follower as jennem1. I love that their products are made in the USA and I thought it was interesting that the company was started by some dads from Atlanta. I learned that they give a portion of their profits to children's charities! Great company! Thanks! Love that their products are made from 100% recycled cardboard. They have a fun photo gallery of customers designs and creations! they gve donations to children groups ty. I learned that their products are 100% recyclable. I love that they give 10% of their proceeds to children's charities. Having 8 young children and grandchildren between the 3 of us, we knew firsthand the value of encouraging children to be creative and imaginative. A portion of their proceeds are donated to children's charities. our product is made of 100% recycled cardboard materials and 100% post play recyclable. We have also aligned ourselves with other eco-friendly companies for our components. And, to complete the spirit behind our "by children, for children" message, we give a portion of all proceeds to benefit children's charities. I think its great that their playhouses are made in the U.S.A. using 100% recycled cardboard materials, and are 100% post-play recyclable as well. I think it’s interesting they had a segment on The Today Show. The company has been awarded the Seal of Approval from the National Parenting Center. They are also an eco-friendly company. I read that they give a portion of all proceeds to benefit children's charities. It's great that they are made from recycled material! A portion of all proceeds are donated to children's charities. I found out that they they also sell natural soy crayons! I became a fan of KidsCraft on Facebook. Found out they were on the Today Show before!